Leaves 1.5–8 cm long, 1.5–2 mm wide. Inflorescence semiglobose to globose, 4–6 mm diam., a mixture of male and female flowers, or sometimes predominantly male or female. Bracts with inner surface glabrous; outer bracts obovate, scarious, soon ± concealed on older inflorescences, outer surface glabrous; inner bracts obovate to spathulate, greyish, outer surface with short white hairs towards apex on outer surface. Perianth hairy. Male flowers stipitate; outer tepals 3, one tepal linear, other tepals spathulate, sometimes fused at margins; inner perianth shortly tubular, lobes 3, minute, each appressed to stamens; stamens 6. 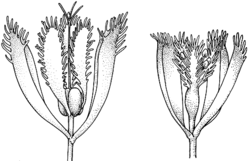 Female flowers with 2 or 3 irregular outer tepals, one tepal linear or absent, others oblong-spathulate, dark brown to black; inner tepals 3, inserted above on floral axis, narrow-oblong to spathulate, white, densely hairy on both surfaces; ovary sessile. Distribution and occurrence: Grows in bog communities and drainage areas, often in running water; inland to Gulgong and Pilliga areas.